Police investigating a road traffic collision in which a Dromore man was fatally injured on the A1 at Hillsborough are eager to hear from an anonymous caller. In a direct appeal to the unidentified man, police are asking that he come forward to speak them about the recent incident in which cyclist, John Flynn (51), was in collision with an articulated lorry while travelling on the A1 between Dromore and Hillsborough. The man concerned made a 999 emergency call, possibly from an A1 roadside diner. A police spokesperson said: “Police received a 999 call from a member of the public who didn’t leave a name or telephone number. “It is possible that this person is able to help us piece together the events leading up to this collision. “Subsequent enquiries suggest that this man was calling from TK Diner, which is not far from where the collision happened, but it is not known where in Northern Ireland this man is from. Cyclist, Mr Flynn, was seriously injured in an early morning collision with a lorry on November 12. 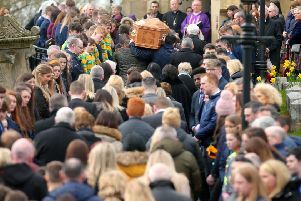 Paramedics attended Mr Flynn within 15 minutes of the collision, which happened just before 7am on the northbound lane near the Hillsborough and Donaghcloney turn-off, and within 25 minutes he was in Belfast’s Royal Victoria Hospital, where he later died. News of his death prompted calls for cycling safety improvements. Lagan Valley MP Jeffrey Donaldson said at the time he was very concerned by the accident and the loss of a life. Local councillor, Mark Baxter, said Roads Service needed to look at the safety of the stretch of road concerned. “The A1 is the second busiest road in the whole of Ireland and because it is a carriageway it can be quite dangerous,” he said. Lagan Valley MLA and NI21 party leader Basil McCrea said the tragedy was “a poignant example of why the Department of Regional Development must invest in better cycling infrastructure”. Alliance MLA for Lagan Valley, Trevor Lunn, said it was incumbent on all road-users to exercise extreme care and be vigilant for others and Ulster Unionist Upper Bann MLA, Jo-Anne Dobson, said she was “shocked and saddened” by the fatality. Last week a concerned Dromore resident said the authorities should consider introducing a cycle lane on the hard shoulder on both sides of the A1 from Newry to Lisburn.